The USD 420 Board of Education, Osage City, has announced that a contract for superintendent of schools has been offered and accepted by Troy Hutton, Osage City. The action was taken at a special meeting May 3. His duties as superintendent begin July 1. Hutton was Osage City’s assistant principal for three years, beginning in 1999, before becoming the high school principal and 9-12 athletic director. He has served the district in that capacity for the last 10 years. Prior experience includes teaching middle school social studies, English and high school business at Plainville, as well as coaching several sports during the seven years preceding his move to Osage City. Hutton and his wife, Kerri, have been married for 20 years this June, and have a daughter, Georgia, who is in sixth grade at Osage City Middle School. Kerri is a home loan processor for the Bank of Osage City and a substitute teacher. They have been members of St. Patrick’s Catholic Church since their move to Osage City. 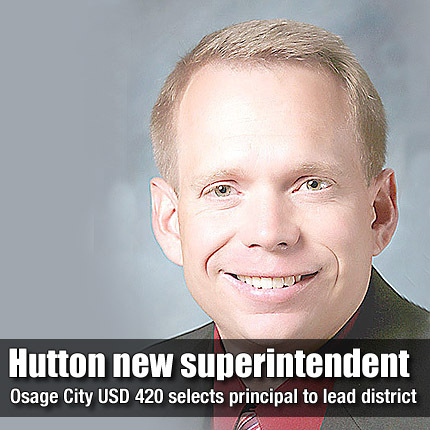 “Since I have been in Osage City, I have seen the district accomplish some great achievements, from increasing assessment scores to state championships to passing bond elections,” Hutton said. “However, the best thing about the school and community has definitely been the people I have had the privilege to work with and have gotten to know in this community. Osage City has become home for us and I see great things in the future of this school district. The district is committed to excellence and this is why I was interested in this position. “Our fine arts programs are second to none, and I am very proud of our athletic accomplishments,” Hutton said. “We have won several championships and I am extremely proud to be a part of the Flint Hills League. Hutton is excited about the future of the district and looks forward to working together to make the district the best it can be.